Stephanie Dang, Hawaii Baptist, So. Brooke Kodama, University High, Sr.
Kacey Kuchenbecker, Le Jardin, Jr.
Kelly Kuchenbecker, Le Jardin, Sr.
Markayisha Masani, University High, Jr.
Alissa Pacarro, Saint Francis, Sr.
Lacey Satele, Saint Francis, Jr.
Rylie Wada, Hawaii Baptist, Jr. 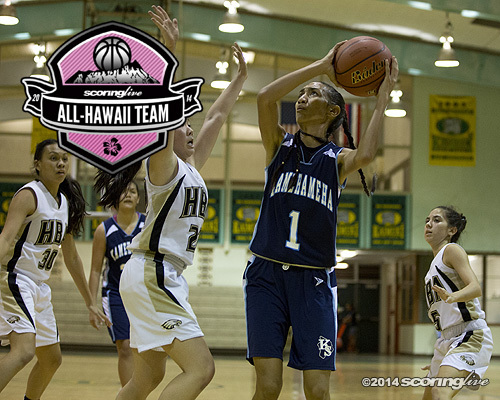 The ScoringLive All-Hawaii Division II Girls Basketball team is a selection of some of the best across the state. The complete list features a widespread collection of players, which covers five leagues amongst five different islands. Like the Division II Girls volleyball state tournament, the Hawaiian Airlines/Hawaii High School Athletic Association Division II Girls Basketball Championships came down to two Big Island Interscholastic Federation teams in the tourney final. It is only fitting that the Division II top individual honors hail from those two teams. Honoka'a coach Daphne Honma is the ScoringLive Division II Coach of the Year after guiding the Dragons to their first state title in school history. The Dragons also compiled an overall record of 16-3 (11-2 in BIIF play), only losing to Roosevelt, Konawaena and Hilo. 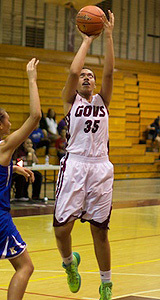 Honoka'a was ranked ninth in the final week of the inaugural ScoringLive/OC16 Girls Basketball Power Rankings. 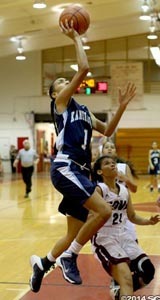 Casey Poe, a 5-foot-10 senior swingman for Kamehameha-Hawaii, takes home the first ever ScoringLive Division II Girls Basketball Player of the Year award. Poe is no stranger to success, having played in the Division II championship game in all of her four high school years. Although she wasn't able to end her storied career with a victory, her performance in the state tournament was truly remarkable. During the four-day span of the Division II tourney, Poe averaged 22.8 points per game on 53.9 percent shooting, as well as 10.3 rebounds, 3.8 steals and 2.3 blocks. 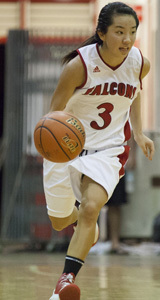 Joining Poe in the backcourt of the Division II first team is Kalani senior Carly Kakuda. The 5-foot-2 guard averaged 15.2 points per game during the Oahu Interscholastic Association Eastern Division, leading the Falcons to an OIA White championship appearance. 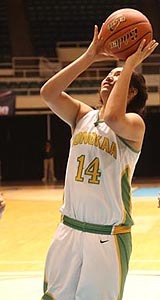 Kakuda's biggest regular season performance came against Farrington, where she scored 27 points with three 3-pointers made. Headlining the frontcourt of the Division II first team are a pair of Farrington twin towers. 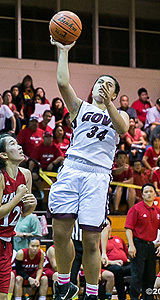 The tandem of senior Penina Faumui and junior Jeneva Toilolo were instrumental to the Governors' OIA White title run, their seventh overall and first since 2011. As a duo, Faumui and Toilolo combined to average 41.6 points per game during the regular season. Rounding out the first team is Honoka'a senior Hunter Liftee. The 5-foot-9 center came up big for the Dragons in the Division II championship game, scoring 24 points on 75 percent shooting, with 12 rebounds. Her performance in the final game of the season helped lift the Dragons over two-time defending state champs, Kamehameha-Hawaii.